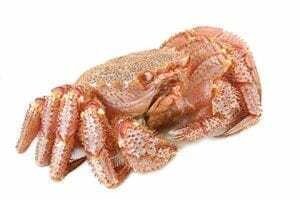 As the largest of the commercially harvested crabs, the king crab is aptly named. It is found in cold oceans worldwide, growing up to six feet from leg tip to leg tip. Each crab offers a bounty of mouthwatering meat that may be prepared a number of delicious ways to add flair to your menu. The upper section of the walking leg yields the most succulent meat, which is marketed as “fancy”, but the body meat is quite delectable as well. King crab is moist with a rich, sweet flavor that will thrill your crab-loving customers. The king crab offers a mild adaptability and easy preparation that will please your busy chef. Whether it is chunked, flaked or shredded it can be served hot in soups and stews or cold in crab salad for a lovely array of menu items. Diners often enjoy simple steamed legs still in the shell, served with melted butter. King crab are caught with traps, which make fisheries low in bycatch. These traps are designed to allow small crabs – those that are below legal size – to escape from holes in the sides of the trap. The traps do not cause any significant harm to the seafloor or sensitive habitats. Responsible and effective fisheries management has kept the two primary king crab populations in Alaska healthy and abundant. Other crab fisheries have been overfished in the past and are now closed to allow time to recover. The team at Pucci Foods strongly believes in supporting sustainable fisheries. We recognize that responsible management, such as that found in the king crab fisheries, is essential for allowing marine ecosystems to thrive. Join us in supporting these industries by purchasing your king crab from us to provide your diners with a certified sustainable seafood meal. Contact us today by filling out the form on this page and we’ll provide you with wholesale king crab for your next event.